Sequel to Mario's Picross, featuring Mario and his greedy nemesis Wario. Each puzzle is a grid with numbers next to each row and column. Each number represents a solid line of blocks that must be filled in on that line. More than one number means that you must separate the lines of blocks with spaces. 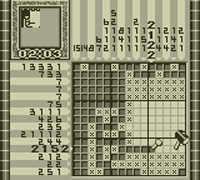 The puzzles in this game are more difficult than those in the original, and the solutions may require you to complete multiple puzzles. Mario puzzles give you a time penalty when you make a mistake, while Wario puzzles don't tell you if you've made a mistake at all.